Announcer: These people, dressed as they are, come from all over the United States to make deals here in the Marketplace of America. Let's! Make! A Deal! And now, here's America's Top Trader, TV's Big Dealer, Monty Hall! Monty Hall will always be linked to this classic game show. A lot of people probably wouldn't list him in their Top 10 game show hosts but he's on mine. 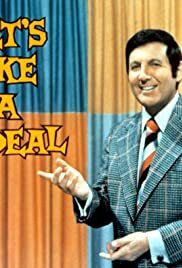 Monty Hall, like Gene Rayburn of Match Game, had no ego and respect for his contestants. I think the fact that he was Canadian made him more agreeable and friendlier. Let's Make A Deal allowed us to see how much greed would play in a factor with people. Would they accept what they had or risk it all for a chance to win something better and would it work out? Will they get the "booby prizes" (the zonks)? It's fun to see the people in crazy Hallowe'en costumes, the horrible cars they gave away, or the zonks. If you have GSN and you're an early riser then check out this gem; although considering that GSN is planning a big change to their network in mid-March you might not get another chance for awhile. Monty Hall is a rarity in the fact that he appeared in almost every version of the show. He even did a Canadian version. Without the Dealmaster, it wouldn't be the same.